Comments from Mr. PGC: Throughout history, many people have made lasting contributions to the world of plants. In these pages, we hope to pay tribute to some of them. Our concentration will be primarily on those who have introduced plants to the gardening world, those who have helped spread the word about gardening and those who have made significant contributions to landscaping and landscaping design around the world. This list will be constantly growing as we add new names. If you have someone who you think should be on the list, please send us an Email. Although known mainly as a philosopher, Bacon gardened extensively at his estate at Gorhambury in Hertfordshire, England. The notes he made about the design and layout of the four-acre water garden may be found in the British Museum. Born in South Haven, Michigan, Bailey started his career at Michigan Agriculture College (now Michigan State University) under the tutelage of W.J. Beal. In 1885, he established the Department of Horticulture and Landscape Gardening at Michigan State, the first such department in the U.S. 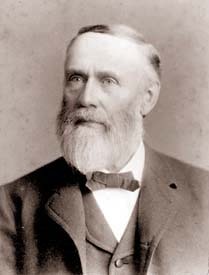 In 1888, he became a Professor of horticulture and botany at Cornell University and became its Dean of the College of Agriculture. Bailey was an influential botanist and horticulturist who helped create the modern study of cultivated plants. He and his daughter, Ethel Zoe Bailey, compiled the massive work, Hortus: A Concise Dictionary of Gardening, General Horticulture and Cultivated Plants in North America. Like so many independently wealthy men of his era, Banks dabbled in science as a hobby. He financed the botanical aspects of a world ocean expedition by Captain Cook and accompanied him on the voyage to search for new plants. In 1771, Banks returned from a trip to Botany Bay in Australia with over 1,300 new plants. Later, Banks was appointed horticultural and botanical advisor to the Royal Botanic Gardens at Kew. Sir Joseph served as President of the Royal Society for more than 40 years and funded plant collection expeditions by several other well-known plant explorers. These adventurers were sent to North America, South America, Africa, Australia and South Seas where they were credited with introducing over 7,000 exotic plants to Europe. Included in the group sent out by Banks were Francis Masson (South Africa), Anthony Pantolean Hove (India), David Nelson (Captain Cook's 3rd Voyage and with Captain Bligh on HMS Bounty), Peter Good (Australia), George Caley (New Holland) and William Baxter (Australia). Plant species associated with Sir Joseph Banks often include the epithet 'banksii.' Some of them are Grevillea banksii, Pterostylis banksii, Leptaspis banksii, Onychoteuthis banksii, Hormosira banksii, Hibbertia banksii, Heteronympha banksii, Astelia banksii, Musa acuminata subsp. banksii, Cordyline banksii, and Musa banksii. John Bartram was considered to be the first American born botanist who made a significant impact on horticulture. He was a farmer who lived near Philadelphia where his home and gardens are being preserved and are open to the public. Throughout his life, Bartram travelled extensively in the Eastern and Southeastern U.S. in search of plants to send to Sir Joseph Banks and Peter Collinson in England. During those years, he helped introduce many American tree, shrub and herbaceous perennial species to Europe. He also founded the Philadelphia Botanical Garden at Kingsessing, Pennsylvania in 1728. In 1777, he discovered an unusual flowering tree on the banks of the Altamaha River in Georgia. He brought seedlings back to his farm and named it Franklinia in honor of his friend, one of the American founding fathers, Benjamin Franklin. Among his introductions to England were Mondarda didyma (beebalm, Oswego tea, horsemint or bergamot), Phlox divaricata (woodland phlox), Lilium superbum (Turk's Cap Lily), Actaea simplex (formerly known as Cimicifuga simplex), and Matteuccia struthiopteris (Ostrich fern). William James Beal studied under famed botanists, Louis Agassiz and Asa Gray, at Harvard University in the 1850s. He lectured in botany at the University of Chicago before serving as Professor of Botany at Michigan Agricultural College (now Michigan State University) from 1870-1910 where one of his students was Liberty Hyde Bailey. In 1879, Beal designed what is now the oldest continuously operated botanical garden in the U.S. on the M.S.U. campus in East Lansing, Michigan. Dr. Beal began his famed plant vitality experiment with 1,000 seeds from twenty different plant species. The seeds were carefully placed in glass containers, hermetically sealed and buried in a "secret" location at the gardens. Periodically, staff of the gardens exhume a container of seeds to check their viability. It has been found that certain seeds will germinate even after being stored this way for 125 years. Beal wrote, The New Botany, in which he emphasized naturalistic design with both native and exotic plants. His outdoor laboratory (W.J. Beal Botanical Garden) has expanded to 6 acres and over 5,000 species. The plants are divided into categories based on plant families or economic uses. Josephine married the Vicomte de Beauharnais, then Napoleon I, from whom she was divorced in 1809. Empress Josephine gathered a famous nineteenth century collection of roses at the Château de Malmaison. The roses she collected may still be seen at l'Haÿ-les-Roses in Paris. Designer of the late 17th century exotic topiary garden at Levens Hall, Cumbria, England between 1690 and 1720. French Canadian governor and plant collector. The genus, Begonia, is named for him. German professor for whom the genus, Bergenia, was named. He is most noted for being the author of the book, Flora Francofurtana, which was published in 1750. Nineteenth-century medical doctor and botanical designer of Mt. Auburn Cemetery near Cambridge, Massachusetts. He was among the first in the United States to propose multiple uses for cemeteries such as picnicking, civic ceremonies and general open space purposes. A Scotsman who spent most of his time in France, Blaikie laid out the gardens of Château de Malmaison for the Empress Josephine. He also made the original plan for the remarkable garden at Bagatelle in Paris. He was a proponent of a return to simpler and less formal garden designs. Blomfield also designed the terrace garden at Mellerstain in the Scottish Borders and the Sulgrave Manor garden. Speaker, lecturer, author, plantsman and president of Blooms of Bressingham Nursery in Norfolk, England. He is the son of famed plantsman, Alan Bloom (see below). His gardens at Foggy Bottom are noted for their collections of conifers and heathers and are located immediately adjacent to his father's famous, Dell Garden. Alan Bloom was one of the great British plantsman of the twentieth century. A gardener from the age of 16, he bought Bressingham Hall, in Norfolk, England in 1946 and founded a world-renowned gardening dynasty that today spans three generations. He was the creator of the six acre Dell Garden at Bressingham where he pioneered the use of hardy perennials in "Island Beds" which was a new concept in the mid-1950's. As a plant breeder, he was also responsible for breeding and introducing nearly 200 cultivars of herbaceous perennials. He was a founding member of the Hardy Plant Society in 1958. Plants associated with the Bressingham name include Aconitum 'Bressingham Spire', Bergenia 'Bressingham White', Dicentra 'Alan Bloom', Geranium psilostemon 'Bressingham Flair', Hosta 'Bressingham Blue' and Thymus 'Alan Bloom'. The genus, Bougainvillea, was named for this French explorer who was the first Frenchman to circumnavigate the world. English amateur gardener and author of three classic books, My Garden in Spring, My Garden in Summer and My Garden in Autumn and Winter. Among the plants named in his honor include Erysimum 'Bowles' Mauve', Crocus chrysanthus 'E.A.Bowles', and Viola 'Bowles' Black'. Bridgeman worked on landscapes of a massive scale, creating gardens that used the grass-clad shape of the land itself. His designs were used at Claremont, Rousham Hall, Blenheim Palace in Oxfordshire, Stowe, Wimpole Hall, Wolterton Park and in Kensington Gardens in London. Capability Brown (His nickname came from his habit of saying that a place had great "capabilities".) started as an under-gardener and finally the head gardener to the Duke of Grafton. In 1764 he became the Royal Gardener at Hampton Court Palace where he continued to work until his death in 1782. The famous grape vine which still exists there today is said to have been planted by Brown. Brown is largely responsible for changing the English landscape from a formal design of knot gardens, parterres, and topiaries to informal, meandering paths, streams, serpentine lakes, and rolling hills with scattered groupings of trees. He tried to create a "natural," yet man-made, look to the landscape. He viewed his designs as tasteful improvements on nature, yet also having some function and utility to man. Applauded by many for his new style, he was criticized by others for destroying so many of the prized formal landscapes and plantings of his time. His designs were used at Blenheim Palace (Oxfordshire), Bowood, Chatsworth (Derbyshire), Chilham Castle, Claremont, Clumber Park, Croome (Worcestershire), Euston Hall, Harewood House (Yorkshire), Petworth House, Luton Hoo, Sheffield Park, Stowe (Buckinghamshire), Syon Park (Middlesex), Warwick Castle, Wimpole Hall and Wrest Park. The genus, Brunnera, was named for this Swiss botanist. Born in Scotland, Buchanan emigrated to New Zealand in 1851 where he was a gold prospector and surveyor. During his expeditions throughout the country, he identified and made drawings of many new plant species. Plants associated with him bear the name buchananii including Carex buchananii, Clerodendrum buchananii, Acaena buchananii, Aloe buchananii, Hebe buchananii, Pittosporum buchananii, Salvia buchananii, and Newtonia buchananii. Budding is the Englishman credited with inventing the lawn mower in the 1830s. Before then, sheep and other livestock or gardeners with scythes trimmed lawns. His invention made expansive lawns possible and popular, much as we see them today. Note: It is up to you to consider the pros and cons of the impact of this invention. British botanist and clergyman who published an English flora book in 1708. The genus, Buddleia, (butterfly bush) was named for him by Linnaeus. A wealthy cotton trader, his private garden in Cheshire, England later became the Ness Botanic Gardens. He was especially interested in primroses and the species, Primula bulleyana is named for him. Other plants bearing his name include Adenophora bulleyana, Iris bulleyana and Salvia bulleyana. From his home in Santa Rosa, California and nearby Sebastopol, Burbank conducted his experiments in plant breeding. During his 50 year career, he introduced more than 800 new varieties of plants including over 200 varieties of fruits, many vegetables, nuts and grains, and hundreds of ornamental flowers. Burchell began his career working at the Royal Botanic Gardens at Kew and later became Superintendent of the Botanic Gardens on the Island of St Helena of 1805. Around 1815, he moved to South Africa where he did an extensive amount of scientific travel. During his years there, he collected over 63,000 specimens of plants and animals to document the species found in the region. In 1825, he went to Brazil and spend 5 years collecting plants from remote regions of the country. With his brother, Albert, he started the Parkwood Nursery in Kingston Upon Thames, Surrey, England. The specific epithet, burkwoodii, was created in their honor. Plants containing this name include: Cytisus scoparius 'Burkwoodii', Viburnum x burkwoodii, Daphne x burkwoodii 'Carol Mackie', Osmanthus x burkwoodii, and Osmarea burkwoodii. An American seedsman and cousin of Luther Burbank, he was known as a hybridizer of flowers and vegetables. By the late 1800's, his seed company was the largest seed supplier in the world. In 1902, Robert Butchart established a limestone quarry about 12 miles north of the City of Victoria on Vancouver Island, British Columbia, Canada. After the quarry was played out by 1908, his wife, Jennie, began to beautify the area with plants. She had thousands of cubic yards of soil brought in and the beautiful gardens were soon attracting large numbers of visitors. It is estimated that thousands of people toured Butchart Gardens each year during the 1930's. World War II caused a shortage of labor and the gardens went into decline. After the death of the Butcharts, their grandson, Robert Ian Ross returned the gardens to their former glory. The Ross family continues to own and operate the gardens.